These are often called Great Speckled Spinners. 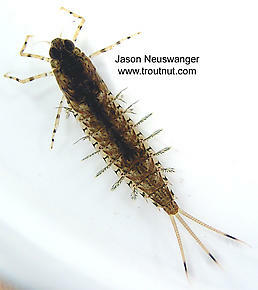 Sadly, the largest mayflies of the early season come in small quantities. Siphloplecton basale matches the impressive size of the Ephemera drakes which follow two months later, but it does not match their numbers. It is common on one of my favorite rivers to see ten to fifteen of these elegant drakes dancing over a riffle in the early Spring. They are difficult to miss in the air, but on the water that quantity cannot get the trout or the angler excited. There are rumors of fishable Siphloplecton days, but I know none of the details. They might be locally important in places angler-entomologists have yet to visit in the prime months, an unsung local treasure like Baetisca laurentina. Siphloplecton basale (Pseudo-Gray Drake) Mayfly Nymph View 4 PicturesThis nymph has double front tarsal claws (Tarsal claw: The claws at the tip of the tarsus, on an insect's "foot.") and double gills on the first three abdominal segments. Male Siphloplecton basale (Pseudo-Gray Drake) Mayfly Dun View 5 PicturesThis one hatched on the same April Saturday that I saw the first Hendricksons of the season. Male Siphloplecton basale (Pseudo-Gray Drake) Mayfly Spinner View 6 PicturesI went to great comical lengths to swipe this spinner from the air with a little aquarium net I carry with me while I'm fishing. Siphloplecton basale spinners fly fast and high over the riffles, and there are never very many of them, so they're difficult to catch. Tarsal claws: The claws at the tip of the tarsus, on an insect's "foot."